January 30; Access to justice remains an unaffordable luxury for a majority of people in Pakistan. The country’s abysmal state of Rule of Law creates an urgent need to bring institutional reforms in three key areas of its justice system: 1) Police; 2) Prosecution; and 3) Legal Aid. Well-trained Police; fair and effective Prosecution and access to Free Legal Aid services are critical to maintenance of law and order. PILDAT is leading a national initiative to shape and facilitate an earnest agenda for bringing reforms in Pakistan’s Rule of Law sector through various advocacy, documentation and legislative activities. As part of this initiative, PILDAT has now released a new Policy Brief Rule of Law Reform Series to inform and influence necessary policy debate and formulation at Federal and Provincial levels. 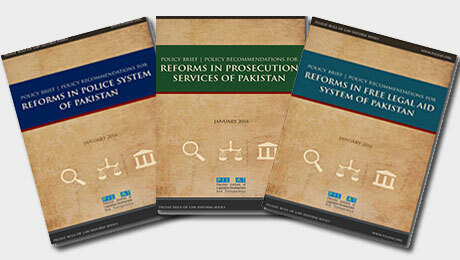 The new series comprises three research-based technical policy documents addressing on the core subjects of Police, Prosecution and Free Legal Aid in Pakistan. The policy briefs have been authored by members of a Committee of Technical Experts constituted by PILDAT for its Rule of Law Reforms Project. Members include Dr. Muhammad Shoaib Suddle, Former Inspector General of Police; Mr. Shahid Hamid, Senior Advocate, Supreme Court of Pakistan; Mr. Azam Nazeer Tarar, Member, Pakistan Bar Council; Mr. Muhammad Ali Nekokara, Former Senior Superintendent of Police; Dr. Suhail Shahzad, Dean, Faculty of Law and Administrative Sciences, Hazara University; and Ms. Ayesha Hamid, Senior Advocate, Lahore High Court. The policy brief on Police provides various noteworthy recommendations, such as enhanced capacity building of police through specialised training schools; increase in budget and police strength annually by at least 10%; improvements in infrastructure; and security of tenure. Similarly, the policy brief on Free Legal Aid proposes amendments in Free Legal Aid Rules 1999; leading public awareness campaigns; and allocating adequate funds to relevant departments for strengthening s committees established for streamlining free legal aid. Additionally, all three briefs also include various significant proposed reforms suggested by key stakeholders during several consultative sessions that PILDAT has held since September 2015 with leading members of judiciary and legal community, relevant Government departments, Parliament, Punjab and Sindh provincial assemblies, as well as the national media. PILDAT’s “Reforms in Rule of Law in Pakistan” Project is supported by Development Alternatives Inc. (DAI) under the Enhanced Democratic Accountability and Civic Engagement (EDACE) project.